India’s education sector has grown to enormous proportions. With more than 1.5 million schools. The building blocks of a nation are the citizens of its tomorrow. The way these seeds will sprout, will always depend on the way you choose to water them.” India’s education sector has grown to enormous proportions. With more than 1.5 million schools — 1.1 million of them run by the government — and more than 250 million students, the country’s K-12 school system is one of the largest in the world. India’s education market, currently valued at $100 billion, is likely to nearly double to $180 billion by 2020. This new development has been sparked by a 30 per cent compound annual growth rate in the online and digital learning market. The 2009 Right to Education Act (RTE) was designed to guarantee a good education to all Indian children between the ages of six and 14. It requires private schools to reserve at least 25 per cent of their places for disadvantaged children — selected by lottery — and the government must reimburse the schools for the students’ fees. 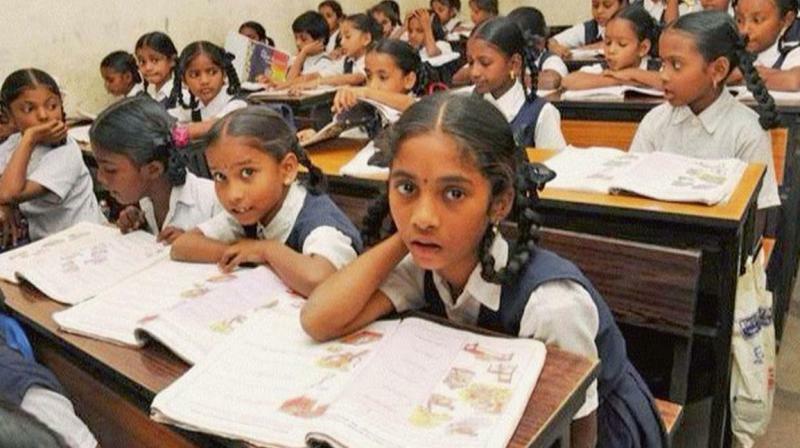 A large investment boost into educational infrastructure has seen about 3.5 lakh new schools opened in the past decade under the government’s Sarva Shiksha Abhiyan programme. The policy is a key component of the Right to Education Act. It is aimed at curbing dropout rates in rural areas, reducing stress and ensuring that youths stay in school until age 14. Eight years on and 99 per cent of India’s rural population has a primary school within a one-kilometre radius. However, India’s public education is in a dismal state. The usual reasons are: teacher absenteeism, poor student attendance, bad infrastructure, inadequate teacher preparation programmes and rote learning practices. While these issues are valid, they do not fully explain the learning crisis apparent in our classrooms. Even though the aim of raising enrolment has been achieved, school completion rates and actual learning outcomes remain pathetic. There has been sharp deterioration in abilities in reading, writing and other comprehensive skills. In particular, the “no detention policy” — the practice of automatically graduating children through the grades until they reach Grade 8, even if their test scores are poor — needs to be revisited, to ensure that it is judiciously implemented. Formal teaching needs to be supplemented by in-school pull-out programmes, after-school reading classes and summer camps by voluntary organisations using innovative pedagogies. More Indian children are in school today than ever before, but the quality of public schools has sunk to abysmally low levels, as government schools have become the reserve of children at the very bottom of India’s social ladder. According to the World Development Report 2018 “Learning to Realise Education’s Promise”, India ranks second from the bottom after Malawi in a list of 12 countries where some Grade 2 students were found to be unable to read a single word from a short text. India also tops the report’s list of seven countries in which some Grade 2 students could not calculate simple two-digit subtractions. These figures are a serious concern in a country where only 74 per cent of its 1.2 billion inhabitants are literate, making India home to the largest illiterate population in the world. We all know that a sound and productive education system needs to focus on science, math engineering and technology — the skills today’s employers are looking for to fill jobs right now and in the future.” Inefficient teaching methods, such as rote learning, which focuses on memorisation as opposed to critical reasoning, are still widespread at the primary and secondary school level. The rote teaching methodology has demonstrated shortcomings. Studies by the Programme for International Students Assessment, an OECD initiative, and Wipro found that students at the primary and secondary school level have fallen back in math, science and reading literacy in recent years. Teacher salaries in government schools are relatively high in India at three times per capita income compared to China, where it is about the same as per capita income. However, we lack a culture of accountability for performance. Learning outcomes are generally better in private schools where average teacher salaries and costs per student are less. a break-up of government spending shows that only 0.8 per cent goes towards capital expenditure, while 80 per cent goes towards teachers’ salaries, leaving little to be spent on infrastructure creation. Teacher absenteeism continues to plague the system, but it is not abnormal, as is made out. A recent six-state study by Azim Premji Foundation reported that, while 20 per cent of teachers were not found in school on average, most teachers were not “absent”; they were away on training or official work, sitting in the state headquarters or on casual leave. Actual truancy rates were 2.5 per cent, which is close to absenteeism rates at any large organisation. India is to truly rise as a global economic power, the policymakers and education specialists must focus its efforts on developing its public schools into a world-class education system. Adequate resources, higher standards for teachers and the flushing out of corruption must all be part of a reform package that seeks to make Indian education the nation’s top priority.